The Samlex DC-AC inverter comes with two different inputs. 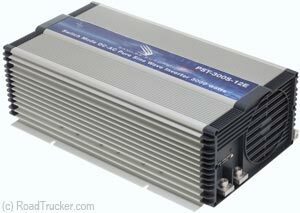 A 12 Volt and a 24 volt DC both rated at 3000 watts with a 230 Volt European 50 Hz Pure Sine Wave AC Output. The unit is also hard wire capable and features temperature controlled cooling, wide temperature operating range, low interference, low battery alarm / shut down, overload protection, and low idle power draw. The inverter comes with pin type battery cable lugs and can be applied for service and recreation vehicles, telecommunications, solar power systems, trucks, and marine.